Carter Page, a former adviser to Trump, has held a press conference at Sputnik HQ following the presentation of 'Departing from hypocrisy: potential strategies in the era of global economic stagnation, security threats and fake news'. Moscow and Washington should work closer together on Syria, terrorism and economic growth, Carter Page, a former foreign policy adviser to Donald Trump’s presidential campaign, said Monday. "We have 99 problems in US-Russia relations," Carter Page said. "Change is absolutely necessary today and we absolutely must work together. Each of our countries have major challenges that need to be urgently addressed. Syria, terrorism, economic growth," Page told reporters in Moscow. "What's preventing us from this task [improving dialogue]? It's definitely misinformation," Carter Page said. 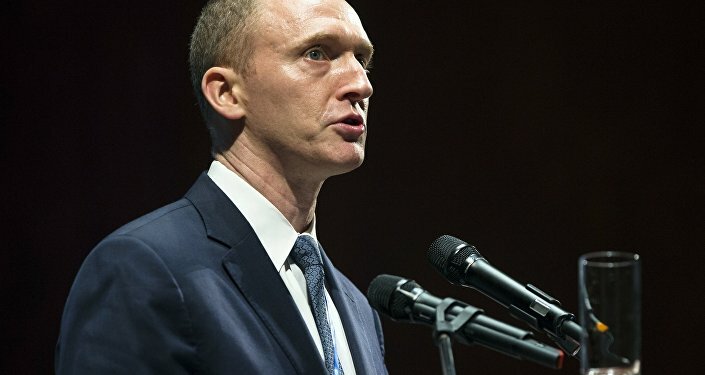 According to Carter Page, the level of misinformation in relations between Russia and the United States reached a new level this year, undermining dialogue between the two countries. "Unfortunately, there's a deep level of misinformation that gives many people false understanding and that really reached a new level in the last, this year actually," Page told reporters. He stressed that Russia and the United States should work together, though there were many obstacles for the cooperation at the moment. "If you look at where the current state of US-Russia relations is, it's much more toxic and much more dangerous and there's a lot more work that needs to be done to overcome this," Page told reporters in Moscow. The new Washington administration will face a lot of challenges, a lot of things need to be done. Fake news are among the latest challenge the new administration will need to deal with. "We have amazing potential right now and I'm proud to be part of it," Carter Page said. "A lot of attempts that Putin tries to do, like fighting terrorism, are ignored by international ciommunity," Page said. Hovewer, Russia and US can cooperate in many spheres and need to overcome megative trends. "Change is absolutely necessary today and we absolutely must work together. Each of our countries have major challenges that need to be urgently addressed. Syria, terrorism, economic growth," Page told reporters in Moscow. Anti-Russian sanctions. Russia and US should return to the business field. But it's too early to speak about US easing its sanctions against Russia. "First, for [lifting of US] sanctions, it's too early to say," Page told reporters. Lack of a bridges between Russian and US research institutions. "We're stuck in that 'cold war' mind set. We have a strong desire to have a new direction in Russia-US relations." Research, business, education — Russia and US should work together in these three major directions. Page also praised Tillerson's achievements on the post of the oil company head, highlighting his interaction with Russian business. "Who will be he next Secretary of State?… I'm very personally excited with this one small example, the major example, is Rex Tillerson being the order of friendship, the major ventures he worked to create in Black Sea, the list goes on. Actions speak louder than words, there's certainly a lot of ways we can certainly work together on," Page told reporters. Speaking about Russia’s alleged meddling in the presidential election Carter Page said that the US administration should present hard evidence of it. "They really need to show core evidence … It's very easy to make it look like exactly it was country's acts – in this case Russia that did this. So I think this is very much overestimated until there's serious evidence," Page told reporters. US media cited intelligence agencies as saying last week they were confident that the Russian government had interfered with the US election process, including hacking the Democratic Party’s servers and leaking sensitive emails to discredit Hillary Clinton and boost Donald Trump’s chances. Trump’s presidential transition team denied the allegations. Speaking about fake news phenomenon, Carter Page said that there were written several fakes about him personally. "In my personal case it was perfect example of the fake news. The fact that I was blamed that I'm a navy officer on the Wikipedia page. It was a total misinformation" the data about his personal life published there, Page said. Page also denied media reports that claimed he had never met the then Republican nominee during his time on the campaign’s staff. "I’ve certainly been in a number of meetings with him," Page told reporters in Moscow. In September, the Politico magazine cited an unnamed policy staffer on the Trump presidential campaign who allegedly said Carter had never met or briefed Trump. "There a lot of lessons we can learn from that," Page said. He thinks it's a sort of good news, that some warmonger information was totally false unlike it seemed at the beginning. 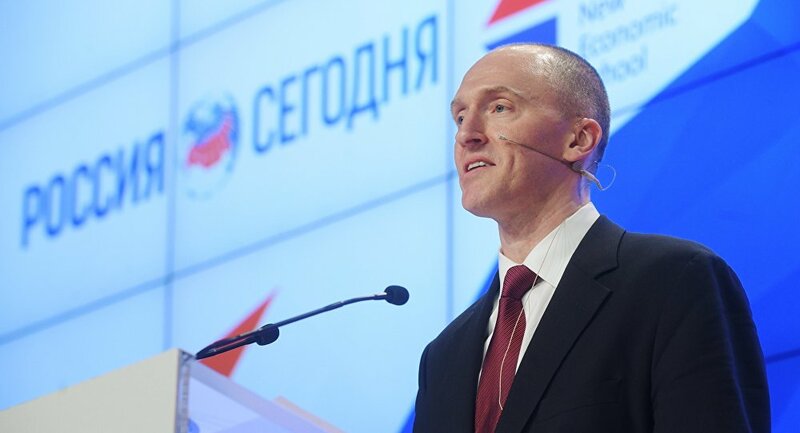 Carter Page also said that Russian people are amazing and he is gratefull to be in Moscow again.